Have been enjoying the #totalmuni2018 saga — two @sfchronicle reporters who are trying to take all the Muni lines in San Francisco in a single day! An equivalent adventure in Los Angeles would take… what… most of the work week? Hmm. There are 170 bus lines in addition to the six rail lines in the Metro system. Assuming — perhaps wrongly — that it takes an average of one hour to ride each end-to-end, I’m guesstimating that riding every Metro route would take about 200 hours, not counting breaks for eating, restrooming and transfering between the routes. We highly encourage someone to try riding our system all at once totweet about it. As for the folks in S.F., an interesting read but not especially illuminating. Frenetic first hour and a half of #TotalMuni2018 and we already missed our first bus. Tensions are high! Bladders are already full! Will we make it to AT&T Park and ride every Muni line in one day? 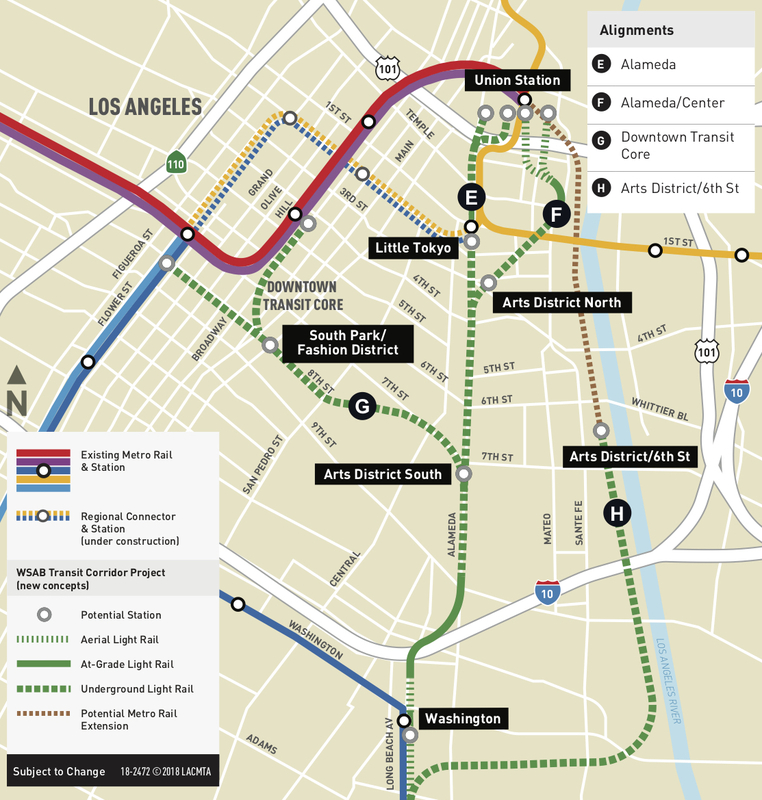 Very good post by Joe Linton provides an update on the project that will build rail between Artesia and DTLA. It’s called the West Santa Ana Branch because: 1) some of the project would be built atop the old streetcar corridor that shared that name, and; 2) the more obscure the name, the better! As Joe writes, Metro staff this month are in the process of narrowing down the northern route options shown in the map above. The routes along Alameda and to the DTLA core had the highest ridership estimate with the underground options also the most expensive (not surprisingly). Of course, there will be more information about all the alternatives with the project scheduled to go before Metro’s Board this month to determine which routes are studied further. I would bet some of you have opinions about this. California also set a goal of having 1.5 million electric vehicles on the road by 2025 and encouraged drivers to buy the EVs. As incentives, the clean air vehicles could use HOV lanes, and in the case of L.A. County, the toll lanes for free — even if the driver was alone. But as Metro staff pointed out, solo drivers in clean air vehicles contribute just as much to congestion and lane delays as do lone drivers in more polluting vehicles. The use of the lanes for free was a good incentive, for sure. On the plus side, the cost of hybrids and electric cars has come down and there are some other good incentives for getting cleaner vehicles — less money for gas and a smaller greenhouse gas footprint. Things to read whilst transiting: a population that pollutes itself into extinction — and it’s not us in the NYT. A good story about a type of microbe that experiences the classic tragedy of the commons. Each microbe pollutes just enough to create a toxic environment for all microbes. Attentive Source readers know that traffic is a type of tragedy of the commons, as is overhunting. This just in: Thanos, IMHO, used a flawed version of the Tragedy of the Commons to justify his plan to wipe out half the universe’s inhabitants — with no environmental review! (Geesh). His argument was the universe didn’t have the resources to support its current population. Perhaps he should have tried a Universe-wide congestion pricing type project first. If Thanos begins handing out outer space-compliant transponders next spring, we’ll know he, too, is an Attentive Source Reader. Not every columnist has heaps of praise for the motion approved by the Metro Board last week asking for Metro to study a “hygiene and mobile shower” for the homeless at or near Metro stations. FWIW, I strongly disagree the pilot program is going to impact property values given the very high property values we’re seeing pretty much everywhere across the region. 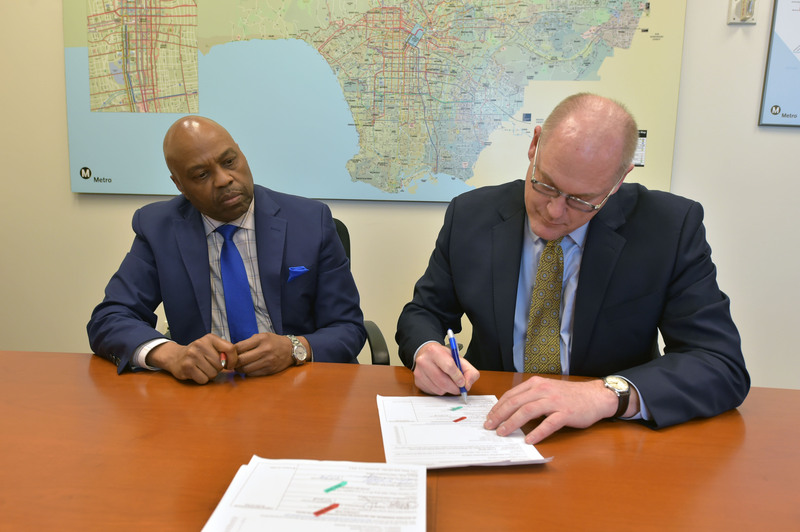 Metro CEO Phil Washington, at left, and the California High-Speed Rail Authority CEO Brian Kelly ink the deal at Metro on Tuesday. Photo: Luis Inzunza/Metro. SACRAMENTO, Calif. – Today, the California High-Speed Rail Authority (Authority) and the Los Angeles County Metropolitan Transportation Authority (Metro) announced the approval of a joint funding agreement that allocates $76.7 million in Proposition 1A bond funds toward the Rosecrans Avenue/Marquardt Avenue Grade Separation Project in the City of Santa Fe Springs. This contribution will be matched by other local funding sources to complete the $155.3 million project. The project will separate vehicle traffic from the rail traffic by constructing an elevated overpass structure which will greatly improve safety, eliminate delays and improve air quality. The crossing, traversed by about 110 freight and passenger trains and over 52,000 vehicles per 24-hour period, has been rated by the California Public Utilities Commission as one of the most hazardous grade crossings in California. Construction is anticipated to start as early as 2021 and the project is targeted for completion in 2023. Since I moved away from Artesia (too bad), I have no use for the West Santa Ana Branch with the connection to the Green Line. I wonder if one day possibly extend the Green Line towards Brea. This will save a lot of driving towards the Norwalk park and ride lot, which is easily full by 7am. Another solution is build a 4 story parking structure at Norwalk. Extend Green Line to the Metrolink station at Firestone and perhaps another 2 or 3 additional stops. The California High-Speed Rail will never get finished when they keep doling out money to anywhere but the high speed rail. I propose they just do half the project to get it going. Connect Fresno to San Francisco. There is more demand from the north with all the sky high property values that have yet to find a floor. Many already buy homes 2 hours outside of the center of San Francisco. Thanos had his fun, but you know everything is reversible in Part 2 of Infinity Wars. Instead of keeping everything pristine when he destroys half of the population, he makes every planet uninhabitable. Not exactly an environmentalist. The homeless does not belong in Metro. You can already see the results in the BART system. Everyone belongs on Metro. How else would you propose someone who is homeless travel? Considering how this rail line may never become a true one-seat ride between LA and Santa Ana, I think a Brea to LAX Line (Yup, LAX) would be better off served by Metrolink. Though considering the now limited space there is on the Harbor Subdivision west of Crenshaw, I doubt a commuter rail line can see the light of day now. Highly unlikely that any LA metro light rail crosses the border into the OC in this century. Orange County seems content on freeway widening and has shown little interest in mass transit. The Muni exercise was minimum one stop per line and excluded all variants, which may be interesting for LA since Rapid routes can differ greatly from the underlying local, as in the case of the 720 which combines the local 18 and 20. You could probably do it in a week by focusing on routes in each region (SFV, SGV, South Bay, Gateway Cities, Westside LA) each day. The challenge will be how to take some of the routes that run hourly, although in those instances I would ride one stop and walk back to the origination point just to knock it off the list. It would have been more illuminating if they were headed to the old stadium instead. I’m here all week. Whatever route is selected for the Northern Segment, there are two absolutes as I see it. My personal preference is a route along Alameda, perhaps in a lid over the Alameda Corridor. I received an email today from WSAB@metro.net that there was a meeting tonight as well as an additional meeting on the 15th in Downey. Re the grade separation in Santa Fe Springs: How can that one grade separation cost $100M? The entire cost of the Metro Blue Line in the late 80s was about $100M, altho it can be argued that this cost was low because the line was essentially rehabbing the PE’s Long Beach line, which abandoned passenger service in 1961. Let’s just stop giving free toll to Express Lanes drivers Metro, they do not deserve toll free and they should pay more than bus riders to use express lanes. Again and Again, Metro Silver Line, FT Silver Streak and other commuter bus lines are already offering reliable and convenient services through the Express Lanes, so there is NO EXCUSE to use Express Lanes. Most drivers are just lazy to ride bus.